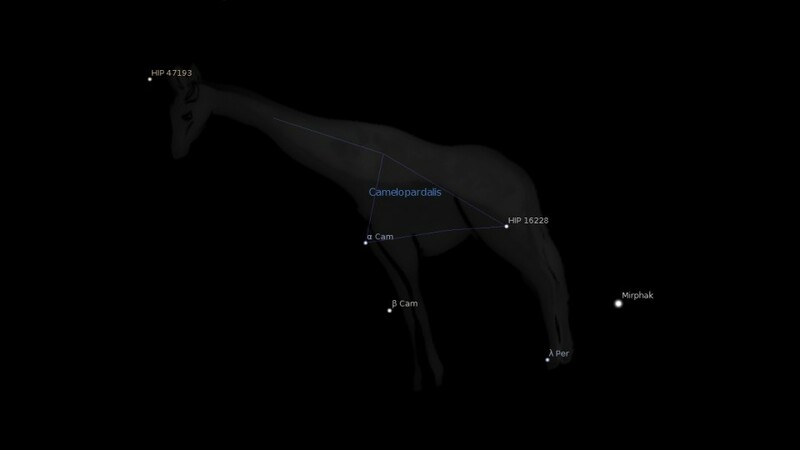 Camelopardalis constellation, the Camel, is a northern constellation above Auriga and below Ursa Minor, between Perseus and Lynx. The brightest stars span 3 degrees of the zodiac sign Gemini. The name of the constellation is a combination of the Greek kamēlos, “camel” and pardalis, “leopard”. 1. Robson, V. (1923), Fixed Stars and Constellations in Astrology. pp. 33. 2. Allen, R. (1889), Star Names: Their Lore and Meaning. pp. 106. 3. Heads-up! Stargazers on alert for rare, possibly epic meteor shower, CNN.